I never leave home without curling my lashes and adding a coat of mascara, doing so always makes me feel polish, chic and complete. Eyes are wide and bright, looking full of life and vitality. After many failed attempts at finding the right curler, I found and settled with Shu Uemura as recommended by savvy gal pal. After trying numbers of lash curlers which have a tendency of crimping the delicate skin on my eyelids accidentally and very painful to say the least, I can happily report this has not happened post Shu Uemura. It must be fabulous as it was mentioned in The Devil Wears Prada, the movie. I smiled with glee and happiness when a gal pal asked if I had lash extension and perm because they looked so long and curly. So what is your favorite curler and why? Agreed - it's the best!! i swear by shu uemura. love all his make-up products. Great, I've added you to my list also! 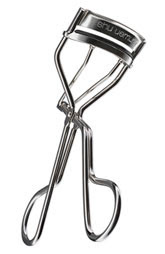 I really want one, I've never owned an eyelash curler but I think it's time I start. I should really give mine another try. I've had one for years... and dutifully bought the newest version when it arrived on the scene. But for some reason I've never liked how I look with my lashes curled.